Wow -- what a weekend! 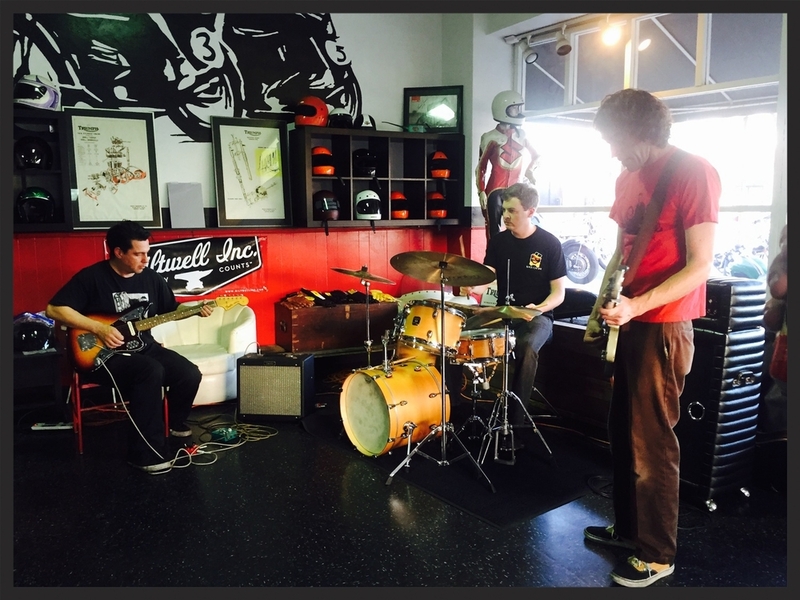 Saturday's event at Trophy Motorcycles in City Heights was a blast. The event featured vintage motorcycles, BBQ, two fantastic vintage shops (Pack Ratt and Puss in Boots), a new Jonny Alexander mural (visible at the corner of El Cajon Blvd. and Winona Ave.), and classic surf sounds courtesy of the 105ers (Mick Rossler on guitar, Matt Parker on bass, and Yours Truly providing crashing-wave percussive flurries on the drums). Adding to the excitement of the event and the mural was its inclusion in the international phenomenon known as the Tony Hawk Twitter Hunt. What better place on that day to find a box loaded with a signed Tony Hawk skateboard deck, a Sony Action Cam, clothes, sun glasses, hats, a helmet, a Sirius Radio subscription, and more? I always have a wonderful time hanging out with my friends and bandmates Mick Rossler and Matt Parker, so the music end took care of itself, of course. Mick owns the Tower Bar and Til Two Club in City Heights, and and Matt owns the Black Cat Bar in City Heights (my three favorite bars, of course), so it was extra special to have small business owners from the neighborhood convene like this. The 105ers will be playing at a City Heights venue again in the near future, but for now please do enjoy the video of us playing the surf classic,"Jack the Ripper." Thanks to Isaac Heinrich from Trophy, Jonny Alexander, and all those who joined us for the fun. Finally, thanks to all of you for reading about it and staying tuned in!